Raith progressed to the fifth round of this year’s Scottish Cup with a 2-1 win over Deveronvale, but were made to struggle for long spells by their Highland League visitors. A double from Brian Graham sealed the victory following an entertaining 90 minutes which saw drama, a host of missed chances, and another Raith red card. Although a 2-1 Cup victory against lower-league opposition may on paper appear straightforward, this afternoon’s game was anything but comfortable for the home side. Deveronvale, cheered off at full-time by both sets of supporters, contributed to an attacking game, creating good chances and maintaining significant amounts of possession. Raith were made to work hard, the relief evident amongst fans and players alike at the final whistle. Robbed of its place in the New Year calendar by this season’s SPL winter shutdown, there was still a sense of possible new beginnings accompanying this afternoon’s fixture. 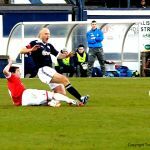 Raith have suffered a torrid November – three meetings with Airdrie, a fraught and controversial home derby defeat, and three red cards have given manager Murray much to contemplate. 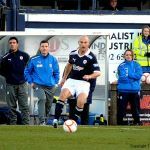 Could Raith relax into a fixture which painted them as clear favourites, and develop some stability and confidence following the recent turbulence? 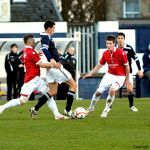 Deveronvale came to Starks Park full of confidence. Fresh from a league win over Keith which leaves them three points behind Highland league leaders Cove Rangers, and with two SFL scalps already taken in this season’s Cup campaign, Deveronvale should not have been under-estimated. Despite the trials and tribulations in Scottish football in recent years, one clear success has been the inclusion and consolidation of several Highland league sides into the national structure. Elgin and Peterhead are third division challengers, and in Inverness Caledonian Thistle and Ross County (who had shared six goals on live television earlier in the day) historians may argue three former Highland league clubs are now represented in Scotland’s top flight. More should follow. Grant Murray picked a strong side – Dougie Hill returning from suspension for Laurie Ellis, with arguably only the injured keeper McGurn and suspended captain Walker missing from an otherwise full-strength Raith side. The match took several minutes to warm up, unsurprisingly perhaps. The sharp clear skies were coupled with a temperature close to freezing point. 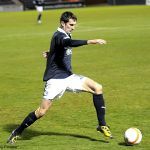 Hill reached two early Raith corners – heading wide then over having worked well to create space to reach Smith’s tempting set-piece deliveries – while at the other end, Deveronvale’s lone striker Kris Duncan worked Raith’s two centre-halves down both channels. 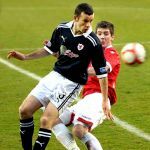 In the early stages, Deveronvale played the role of visitors successfully – Duncan’s physique holding his markers at the bay, allowing foraging midfield runners to profit from his lay-offs. Three Deveronvale players each have seven goals this season, and it was clear early that the 4-5-1 formation adopted early on was not necessarily a defensive one. 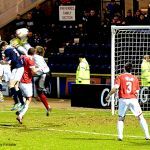 Particularly evident was the visitors’ close-knit midfield three; the suspended Walker’s tenacity was missed as Raith found themselves outnumbered in central areas on numerous occasions. 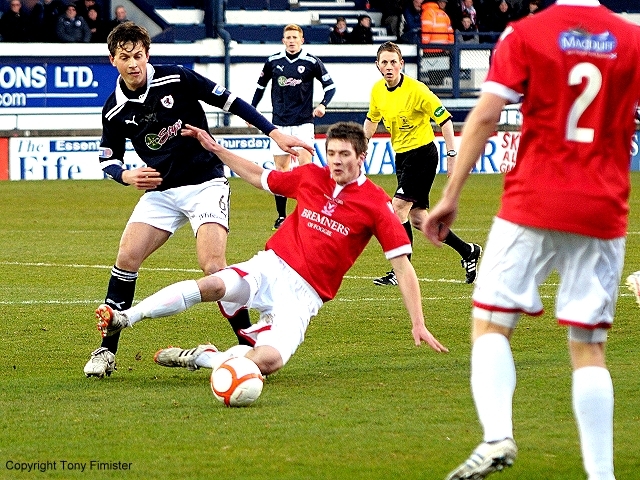 In David Smith, Raith have one of the First Division’s brightest talents and this game’s most eye-catching performer. 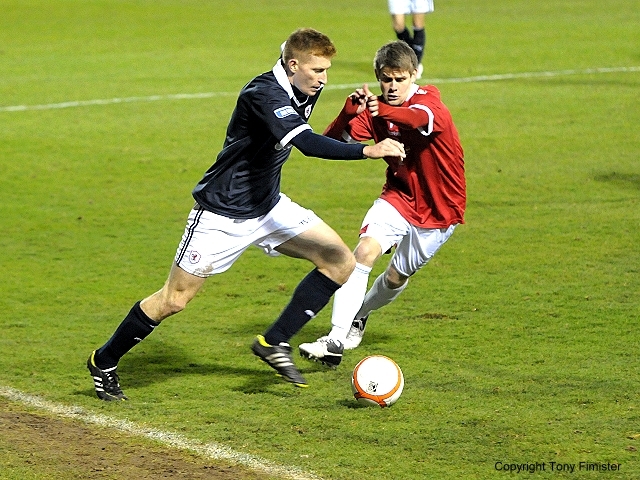 Willing and lively as in recent fixtures, the Scotland u-21 international looked sharp and dangerous, cutting inside his man on twelve minutes to fire across ‘Vale keeper McConnachie’s goal. Several minutes later, Smith volleyed narrowly wide from a Thomson cross. Both Smith and Grant Anderson on the right profited from a narrow ‘Vale defence. Murray had clearly encouraged both full-backs to overlap where possible, frequently allowing both Raith wide-men to cut inside to good effect. Notwithstanding a clear vulnerability to Raith’s crosses, Deveronvale’s passing was fluid and incisive, forcing several corners in an enterprising opening half-hour. Rodger – perhaps mindful of his volleyed match-winner against Keith the previous week – shot over from a corner; home keeper Laidlaw did well to tip over curling cross with Duncan lurking; and, with their best chance of the first-half, a Barclay cross-shot found Cowie alone at the far post but the midfielder failed to take full advantage. Pushing Blackwell up alongside Duncan into a more orthodox 4-4-2 was a clear sign of ‘Vale’s increasing confidence. One concern for Raith will be the knee injury suffered by Mensing on the half-hour, the imposing defender replaced as lynchpin and captain by Laurie Ellis. 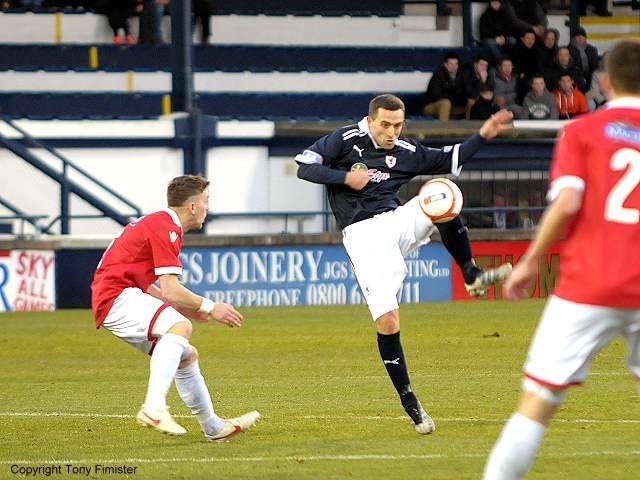 Towards half-time, Raith created several clear chances, and should have gone in at half-time a goal to the good. Clarke’s fierce drive following a neat combination with Graham was punched clear, Grant Anderson blazed wide after being released by Smith, and Graham should have done better from close range after Clarke’s driven cross. 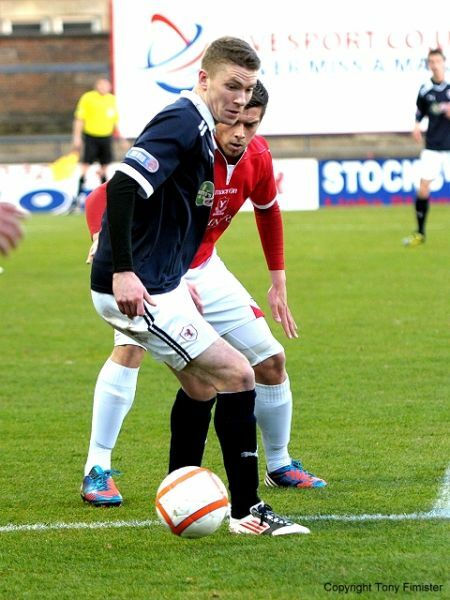 The Raith strike pair had found the mesaure of their opposite numbers. 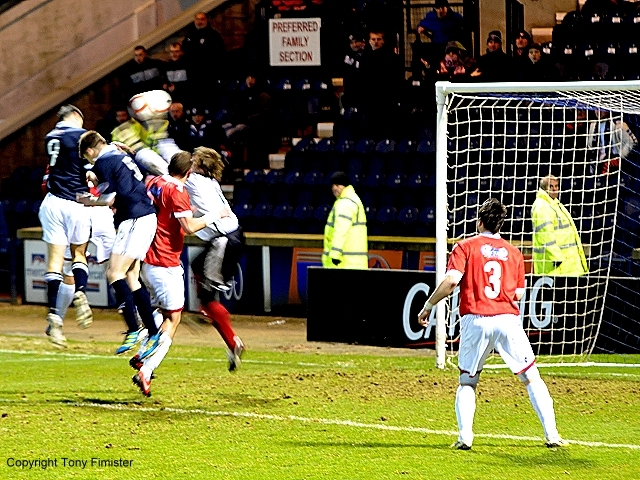 The deadlock was broken on 54 minutes, Graham rising in a crowd to head home Grant Anderson’s cross. 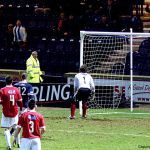 With Smith having been released clear through on goal only minutes earlier, Raith fans may have thought Graham’s opener effectively put Raith’s name in the fifth-round hat. Within two minutes, Deveronvale were level. A lightning counter attack saw Rennie released on the right flank. 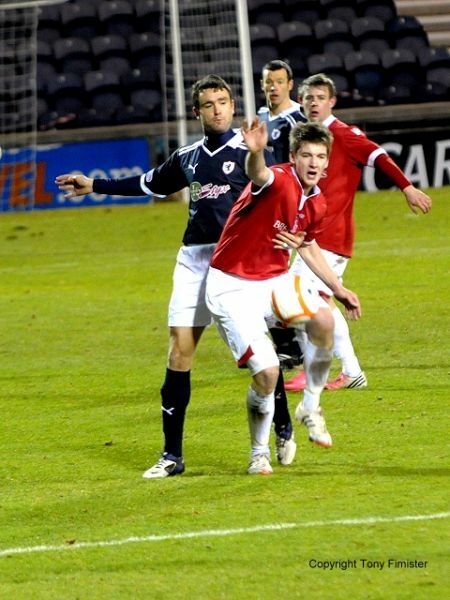 His excellent first-time centre invited Duncan through on goal, only to be bundled over by the trailing Hill. Referee Robertson pointed to the spot, and issued an immediate red card. Murray – who’s programme notes implicitly criticised his team’s recent poor discipline – stared coldly toward his young defender in the aftermath. After an ill-advised second yellow for dissent against Dunfermline in the recent derby, again Hill showed poor judgement. 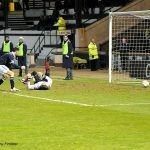 Fraser swept home the penalty. Every obstacle can be an opportunity. As they had in the derby defeat, Raith showed excellent spirit, composure, and strength of character despite the numerical disadvantage. Reece Donaldson, on for Pat Clarke in the wake of the penalty, showed promise and commitment, bursting forward from centre-half and giving an extra option. 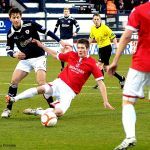 With Hill red-card and Mensing’s early substitution through injury, Donaldson was making his case for a starting role. 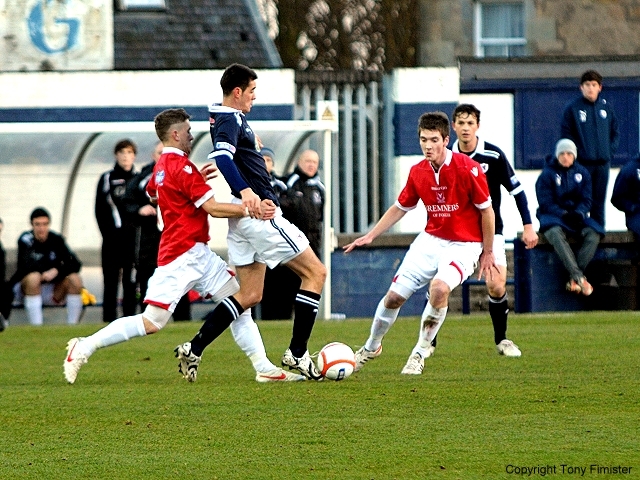 Although Deveronvale enjoyed more possession for a spell, Raith looked more dangerous. Spurred on by noisy support and the possible indignity of a mid-week replay, the best chances fell for the home side. 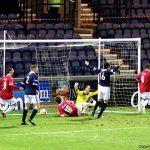 With twenty minutes left, a fine strike from Stuart Anderson rebounded from the junction of post and bar, and although Graham bundled home the rebound at the second attempt, the linesman’s flag doused the Raith striker’s celebrations. Whether the linesman correctly judged Graham’s position as offside when the initial shot was struck – rather than the instinctive reaction to judge when the shot rebounded – is one for future debate. 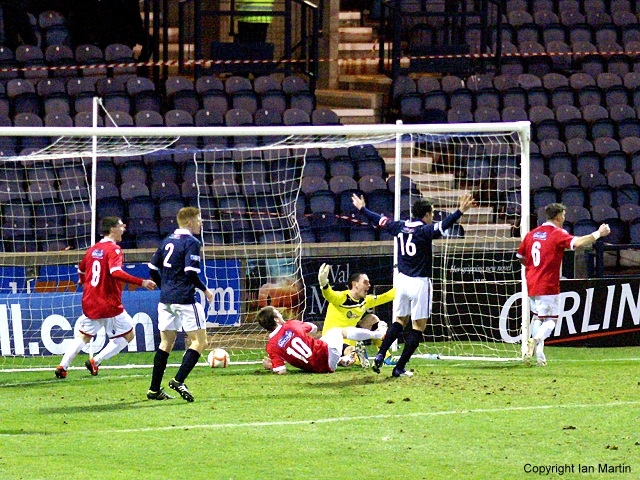 Raith pushed and probed, mounting further pressure upon the away side’s goal. Substitute Spence was pushed up alongside Graham. Smith tormented the struggling Rae (now on a yellow card), frequently providing delicious crosses for Raith‘s front two. One Graham knock-down just evaded the on-rushing Spence, and in a rare foray forward, Smith picked out left-back Malone – at full-stretch, the Raith full-back couldn’t keep his header on target. The closing minutes’ drama played out against the darkened winter skies. With eyes nervously checking watches, Smith was checked as he turned inside. 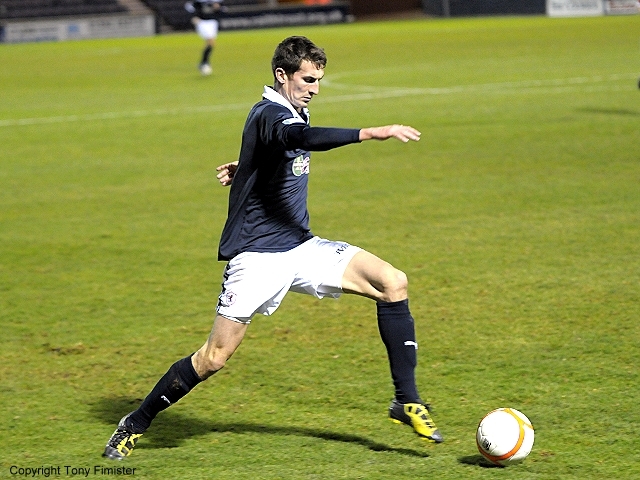 Graham composed himself, and, from 25 yards, stroked a marvellous free-kick into McConnachie’s right-hand corner. 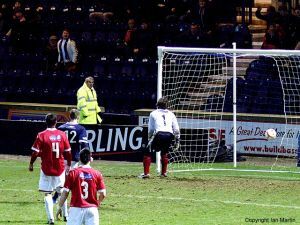 For Raith fans, a moment of release at the late winner; for Raith’s players, a deserved but hard-worked journey into the fifth round looked assured. There was time for a late scare – a high ‘Vale cross swirling in the skies above Laidlaw’s goal. 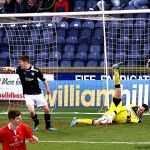 With the ball and a ruck of players ending in the Raith net, the referee whistled early for the infringement on the Raith keeper. Despite the late dramatics, Raith deserved this win. Murray will be disappointed again at finishing with ten men. 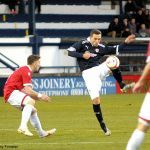 Although Deveronvale will deservedly return to the north-east with heads held high, it is Raith’s players and fans who can look forward to Monday’s fifth round draw. Raith shooting towards the north stand, Vale kick off. 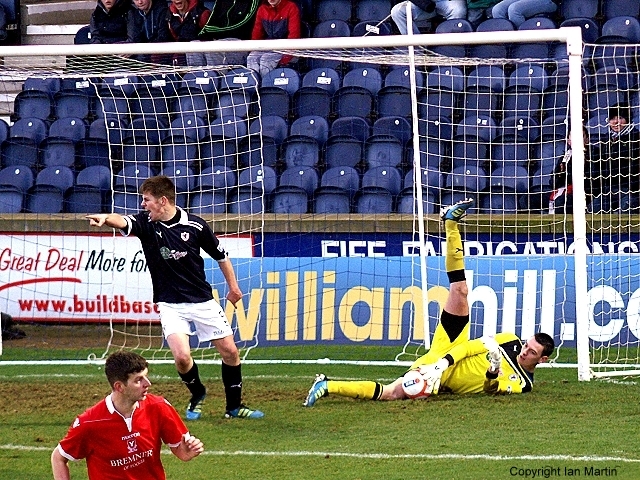 Raith win a corner, Smith's cross met the head of Hill who sent the ball just wide. A yellow flare thrown onto the pitch attracts the attention of the Police. Again, a corner from Smith to Hill, this time he heads over the bar. A Smith/ Graham 1 - 2 sees Smith's shot go wide. Thomson the provider, crosses to Smith but volleys wide. First corner for the Vale, Laidlaw punches clear. The Vale keeper makes a one handed save from Thompson's cross. Laidlaw fumbles a Vale cross, the defence recover. Mensing goes down holding his hamstring. Ellis comes on for Mensing. Smith shoots from twenty yards out, the keeper collected well. 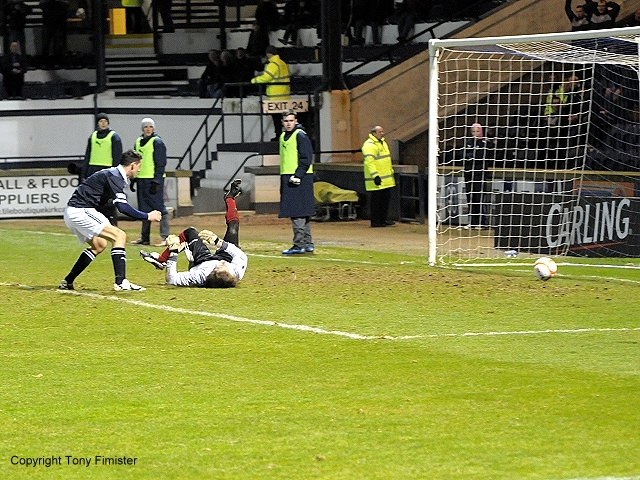 A Cowie shot from close range troubles the Raith goal, Laidlaw just clears. Graham and Clarke combine well, Pat shoots wide. Malone provides a pass to Smith who's shot troubles row Z.
Smith runs the ball up the park, slips a perfect pass to Grant Anderson who shoot wide. Graham shoots an inch wide from two yards. It's proving hard to see the gulf in the divisions. Duncan shoots over from just inside the box. Cowie floats a twenty yard free kick into the box, Laidlaw secures. 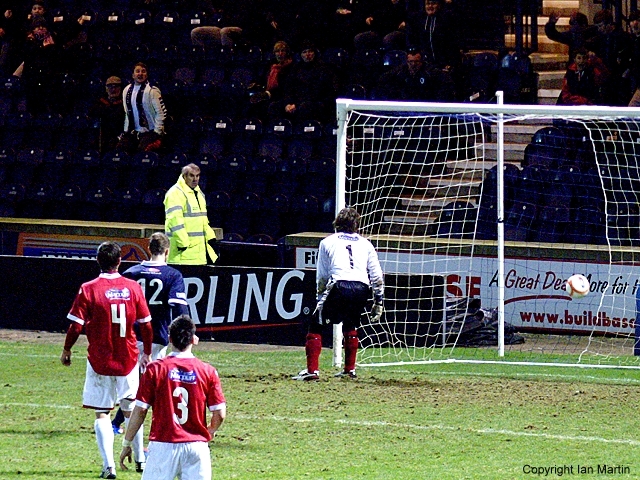 Graham from Grant Anderson's cross, heads in from six yards. Fraser scores from the spot kick. Vale are pressing but getting stifled. Smith shoots just inside the six yard box but the keeper smothered the ball. Stuart Anderson hits the post from eighteen yards, Graham had the ball in the net from the rebound but was offside. 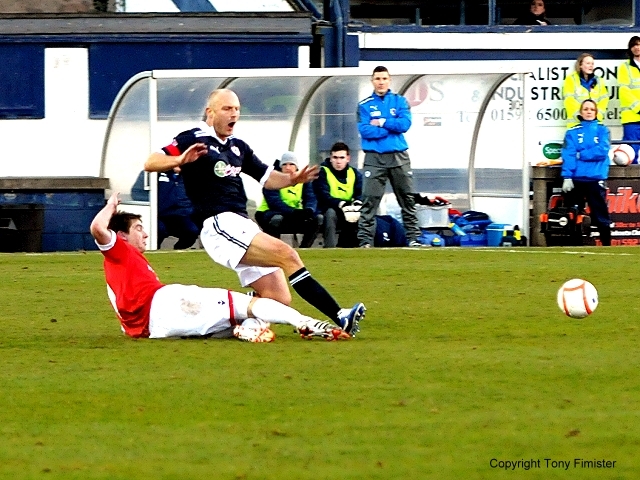 Graham and Grant Anderson collide in the box going for the ball, both get up unhurt. Grant Anderson off, Spence on. Thomson floats a ball into the box, Graham heads downward but Spence can't connect. Graham strokes a twentytwo yard free kick into the top right corner of the Vale goal. A foul on Laidlaw sees a Vale goal chalked off. Laidlaw, Thomson, Malone, Mensing, Hill, G. Anderson, S. Anderson, Hamill, Graham, Clarke, Smith. Subs, Spence, Donaldson, Callachan, Ellis, Roberts. McConnachie, Rae, Adams, Henry, Fraser, Cowie, Rennie, Rodger, Duncan, Blackhall, Barclay. Subs, Noble, Urquhart, Mitchell, Morrison, McDonald. The "GOAL" was chalked off . Foul on the keeper "NO GOAL"
Davie Hancock talked with both managers after Saturdays match.